Experience the Best of Phillyduring your stay at our convenient and newly refreshed hotel. 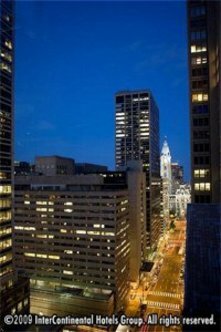 The only hotel located on Market Street west of City Hall we are surrounded by Philadelphia's most prominent businesses, hospitals, universities and government offices. The hotel is located just blocks from the Pennsylvania Convention Center, Amtrak's 30th Street Station and Philadelphia's historic sites and attractions. The Philadelphia Museum of Art, Liberty Bell, National Constitution Center, Independence Hall & Philadelphia Zoo are just a few of the Philadelphia attractions to experience during your getaway. Walk to Center City businesses, fine dining, upscale shopping, museums, Rittenhouse Square, Avenue of the Arts-Theatre District & Antique Row. Experience professional sports with the Philadelphia Eagles and Phillies or visit top rated golf courses in the tri-state area. Plan your visit to the Franklin Institute's exciting Real Pirates Exhibit with our VIP Packages. Relax at our seasonal outdoor rooftop pool with views of the city. The Crowne Plaza Philadelphia Hotel Center City features great hotel deals and packages for family travel and weekend escapes. This hotel is committed to providing accessible facilities under the American Disabilities Act. If your accessibility needs are not met, please contact the Hotel Manager on Duty. Should you require additional information regarding accessible facilities for guests with disabilities, please call 1-800-Holiday (U.S. and Canada) or contact the hotel directly. For the hearing impaired, TDD service is available at 1-800-238-5544 within the U.S. and Canada.